I haven't posted a blog entry in over a month, despite having written a ton during the last several weeks. I've got half-written posts about a trip to Austin, a regional car show fundraiser, stories about figuring out what parts are up to date, dealing with price changes and currency exchange fluctuation, work on our grey and red project cars, damage to my grey car - again, and damage to my red car - again. That's right, our red project car has been damaged again. It's legitimately cursed. And my grey one, but for an entirely different reason. I'll be covering all those topics as I can sort through them, but to keep everyone in the loop with what's going on, here's a bunch of updates! First thing's first! Our TPMS Defeats are back in manufacturing! We had to change suppliers and the transition has been less than expedient. In fact, it's taken me much longer than it should have. The fault is mine and I apologize for any inconvenience the delay has caused. I've added some new product listings. The Exterior Black Pack includes the Carbon Edition black 6-bar grille (which is also a new listing), black window surround trim to replace the chrome trim, and dark-chrome exhaust tips. I've got new handbrake pads in manufacturing right now and they should be ready to go in a week. They'll eliminate the common complaint of the chirp chirp noise that the OEM handbrake pads often have when driving at very low speeds. I've listed the OEM ones as well for anyone that wants to keep their car completely OEM, though. Our high-flow intake filters are now in stock! We've been shipping out the pre-orders and are just about caught up. They're available with both dry and oiled filtration media, and both are washable so you can reuse them rather than dispose of them when your next service comes due. To make it easier for people to swap out their tail lights, I've added tail light installation kits that includes the parts needed for the job. If you're buying a new set of clear tail lights from us, we do include an installation kit so you won't need to buy the install kit separately. Last, and definitely not least, we've got clear and smoked corner markers being manufactured right now. Once those are done, we'll be having side repeaters (the round lights in the fenders) and the rear reflectors (the ones below the tail lights) made to match the corner markers so we can offer them as a complete set. 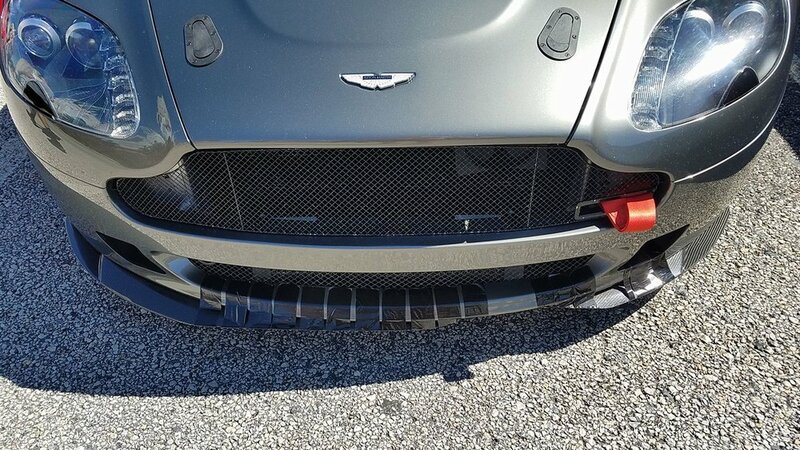 Your Aston Martin can finally have matching exterior lights instead of the silly variety that were fitted to it by the factory! I've also been changing some prices around. 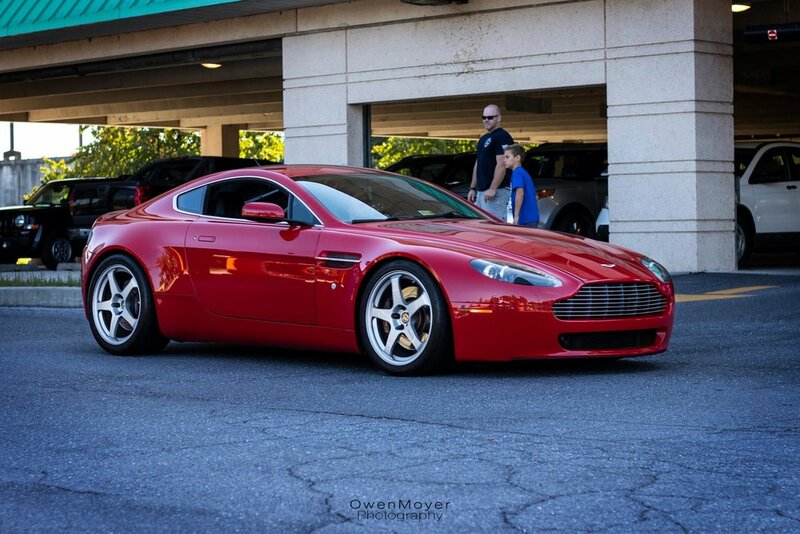 In general, the prices for OEM Aston Martin parts has gone up. Between their own price increases and a worsening exchange rate between the US Dollar and British Pound compared to where it was a year ago, I realized I was barely covering my costs. So those prices have gone up in a few areas. Meanwhile, I've been able to reduce prices on other parts. There's been a slight decrease on prices for Porterfield brake pads, Motul engine oil, and a couple other things. Thanks to the ongoing and expanding business I've had with my catch can manufacturer, I've been able to bring costs down for those, too. And, speaking of catch cans, we've got V12 catch cans in development. We'll be testing a few configurations to make sure we get them just right. Last, an update on the coilovers. We've had the original set of prototypes on my red car for a little while now. I first installed them and set the compression/rebound adjustment to the half-way point. I found them to be a great compromise between comfort and road feel. Then I set them to a softer setting (2/3 soft, 1/3 stiff). You can still feel the road, but they're very comfortable, especially on sharp bumps. I took the car over a few bumps that make me seriously cringe in my grey car (that one has standard struts and H&R springs) and the red car was just fine. I took it over speed bumps - the nasty angular kind they bolt into parking lots - and there was no discomfort. In fact, the noise from the rest of car itself is far scarier than the feel of the rear suspension dropping off the speed bump. I'll be raising the front by a touch to get the level perfect for how I want it and to help prevent scraping. Although it isn't that low (not *quite* as low as my grey one), because I have it at a soft setting, the suspension does compress enough to scrape the underside of the front lip a touch if I approach something too fast (a driveway, for example). It brings up an important point: the coilovers allow you to set them within a range, per se. The stiffer the compression/rebound, the lower you can go. The softer, the less you can lower the car. It generally isn't an issue since everyone I've talked to so far want either a slight reduction in ride height with improved comfort, or the option to go low without as much concern for comfort. It works out pretty well. It's also worth mentioning that the height differences here are very small, too, so there isn't a drastic compromise in ride height if you want a softer setting. As for being production-ready, there's one thing we're sorting out. The original struts have the compression/adjustment knob on top of the struts. That's an easy fix in the front, but not on the rears. So the struts are being redesigned to locate the adjustment knobs at the inside/bottom of the struts. But when the first set was made with the new construction, the valving came out fairly stiff compared to the originals. We're sorting out how to get back to the original 'feel' but with the relocated adjustment knobs. The set on our red car (with the knobs at the top of the struts) are still entirely usable. Last Friday night I was able to adjust the rebound/compression on all four struts as well as the ride height on the front struts in about half an hour from start to finish (on jack stands, wheels off, adjustments made, wheels on, car on the ground). But it isn't as convenient as we'd like, so we're going to see about getting the redesigned struts worked out. I should have a set of those on my car next weekend, along with the upgraded Swift springs. But the bottom line is that I'm very, very happy with how the prototype coilovers have performed, and can't wait to offer the production version as soon as they're ready.